I attended the TriAgile conference in Raleigh, NC on March 30th, 2017 and wanted to share some takeaways from a couple of the talks I saw. Overall, the conference was a nice opportunity to network with some local Agilists and hear about their work and experiences. It was well organized, and I was pleasantly surprised by the size of the Agile community in the Triangle! When boiled down, the fixed mindset views ability as a static attribute that cannot be changed or improved (like height), avoids challenges, is defined by failure, sees effort as being for those who have no talent, and reacts with helplessness in the face of challenge. The growth mindset, or Agile mindset, views ability as an attribute that can be exercised and grown like a muscle, wants to learn, embraces challenge, learns from and is resilient to failure, and recognizes effort as the path to mastery. When put into the context of an organization, a fixed mindset results in companies who hire only “the best talent” and then continuously fire the lowest performing employees (a practice called “rank and yank”). Growth mindset companies hire based on attitude, focusing on growing their employees, providing learning opportunities, and establishing a culture of trust. Mindset is important in the practice of Agile at all levels of an organization, from management, to the teams, to the individuals. A fixed mindset can grow to become an Agile mindset through feedback and experimental manipulations (sound familiar?). Rising offered some practical advice for how to reach an Agile mindset, such as praising effort, practice, strategy, and process rather than talent or innate abilities, and encouraging making mistakes and learning from failure rather than punishing or ignoring it. I found this talk inspiring, and was proud to see that Caktus squarely aligns with the characteristics of the growth mindset companies. Agile is a journey, not a destination: in the end, “reaching the Agile mindset” is not about attaining some nebulous end goal, and more about valuing the process of learning and growing along the way. TEACH: In Teaching stance, the coach relays their expertise on the subject to a group. 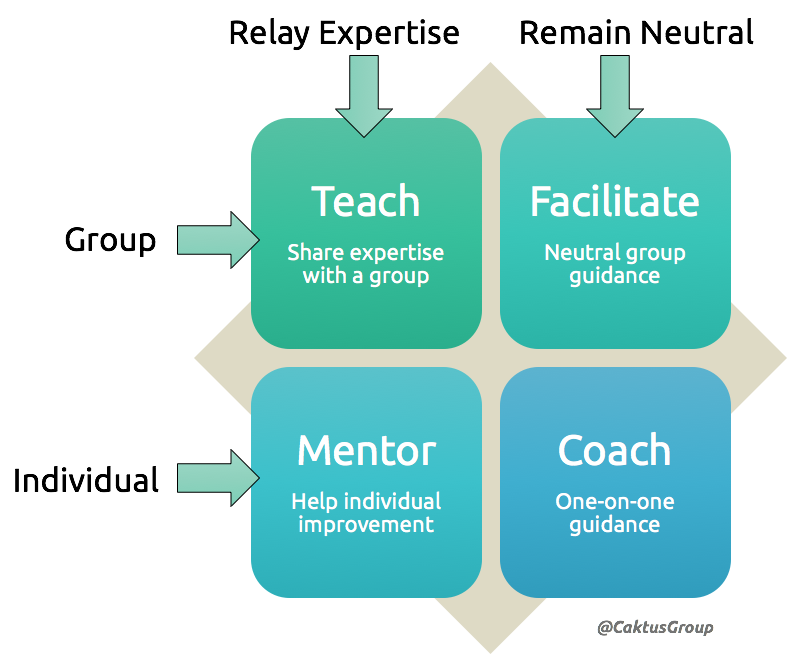 FACILITATE: In Facilitation stance, the coach leaves their expertise at the door and remains neutral in order to facilitate a group’s conversation/meeting/activity. MENTOR: In Mentoring stance, the coach uses their expertise to help an individual improve. COACH: In Coaching stance, the coach remains neutral and guides an individual on their journey to answer their own questions. The most practical advice that I took away from this talk was to ask powerful questions that are open rather than leading, not stacking questions (asking one at a time and giving the person or group a chance to answer), and getting comfortable with silence. Consciously switching stances can be challenging, but knowing which stance is appropriate will get you halfway there. “Things to Consider to Ensure a Successful Minimum Viable Product (MVP)” by Thomas Friend, who emphasized dedicating resources to simplifying the MVP in order to focus on core functionality, building and rolling out a small product, and then improving on it once market feedback can be collected. “Why Are There No Women On Our Team? Cognitive Biases We See in Product Development” by Catherine Louis, who explained some common biases and the benefits of having varied and diverse perspectives on development teams, leading to increased creativity, new ideas, and a broader culture. “Consensus Workshop: Group Facilitation to Generate Creative Solutions” by Becca Halstead, who walked the audience through the Consensus Workshop Method in five stages: Context, Brainstorm, Cluster, Name, Resolve. This method helps generate true consensus from a large number of ideas in an engaging way. “Release Control, Become Good Servants” by Camille Spruill, who outlined the characteristics of a good servant-leader, as well as the goals of building teams and communities, empowering others, and bringing out the best in them. The variety of talks at TriAgile meant there was something on offer for anyone working in an Agile environment. I was tempted to simply follow the Coaching track, but I am glad to have deviated from it in order to see some of the talks that were less directly relevant to my role. I will certainly return for TriAgile 2018, where I also hope to see more pre-conference workshops available.